Though less traditional, having your wedding in the winter doesn’t mean it has to be any less beautiful. I love starting with a color scheme before making decisions about individual materials. Deciding on the color scheme with your soon-to-be spouse can help so many other choices fall into place. Here are some of our favorite color schemes for this season! I love these colors for winter. They exude a warm, comfortable feeling with a sense of sultry from that merlot red. Navy is less formal for the men which could be perfect depending on the style of your wedding. A traditional power suit coupled with bridesmaids in these reds will be sure to impress. If you’re looking for a way to accent your maid of honor, try putting the bridesmaids in navy dresses to match the groomsmen, with the Maid of Honor in the merlot color. Purple is of course incredibly popular for weddings, but what I love here is the combination with the grey for men. Again, the grey doesn’t carry the formality as a traditional tuxedo, but pairing lighter and dark grey neutrals with the plum and lighter purples, really make those colors pop! Another thing to think about is that silvers, pinks and purples make for gorgeous centerpieces and floral designs. Greens can be challenging. It’s one of the colors that always feels right, but can go horribly wrong if you choose the wrong shade. 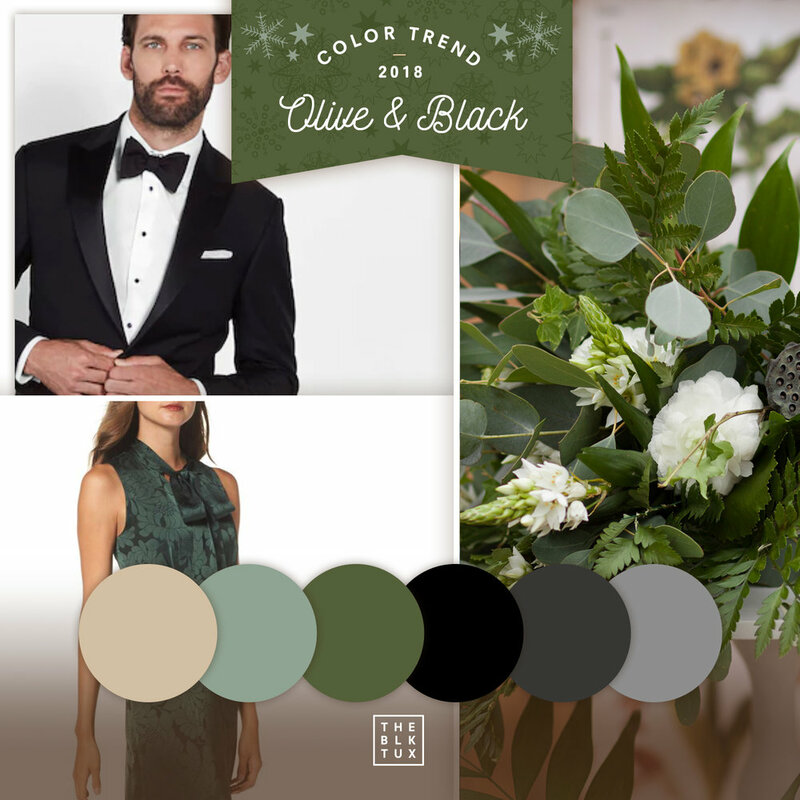 I love this color palette as it incorporates the traditional black tuxedo. A quick note on going traditional: while a black tuxedo is classic, you’ll want to make sure you’re not investing or renting in something that goes so far as to look outdated. We all know that a lot of rentals have the reputation of being, well — ugly. According to publications like Fast Company, The Back Tux offers tux and suit rentals “for the 21st century,” so try them out for a black tux that’s classic but also stylish. Combine your black elements with earthy greens like Olive and more leafy greens. From the dresses to the floral arrangements, everything blends so well when greens like this are utilized correctly. But remember to be careful! Even a couple misplaced greens can throw off a typically beautiful color scheme. Hopefully these amazing winter color palettes can bring you some inspiration. Remember, starting with a theme like these for a winter wedding is the best way to get started. Once the colors are in place, they are the framework that will keep the rest of the planning on track.